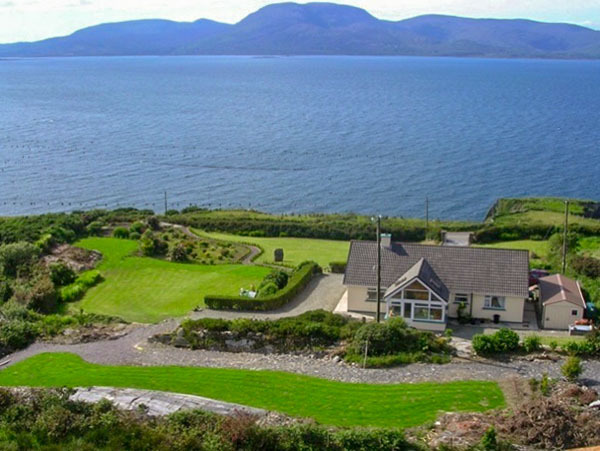 Gouladoo - Ar Neamh Beag is a picturesque holiday home, nestled into the costal hils of Bantry Bay. Sitting on the famous Sheep's Head, and Goat's path walking and cycling route, on over one acre of spectacular landscaped grounds. The house fronts directly onto Bantry Bay providing uninterrupted views of the sea from the front bedrooms, sitting room and dining room, and provides a great base for touring West Cork and Kerry by car as well as local walking and cycling routes. In fact, the spectacular Caha Pass on the mountain road that crosses into County Kerry presents one stunning new vista after another, while Bantry Bay itself will please the eyes as you sit back to relax in the evening, from either the garden or the sitting room window, and watch the fading daylight play on the far shore of the bay. (If you're curious, the name "Ar Neamh Beag" is pronounced roughly as "Or nav byug" and translates as "Our little Heaven"). Spectacularly landscaped grounds incorporating a private area for sun bathing, and natural stone seats at the front of the garden overlooking Bantry bay and the Atlantic ocean. A splendid rockery adorns the rear of the house with views to the Atlantic Ocean to the west. TV and open fire. Kitchen is equipped with microwave, dishwasher, fridge, washing machine, dryer, fridge-freezer, 2* cookers. Main bedroom en-suite in bidet, toilet and shower. Private Parking. There is a convenience store located in Kilcrohane which is 5.6 km (3.5miles) from Ar Neamh Beag. For more general shopping, there is a variety of shops in Bantry which is 17.5 km (11 miles away). Given its location, both inland and sea birds can be observed in and around the area. Hill walking, Cycling, and Angling are all around the Sheep’s Head Peninsula.